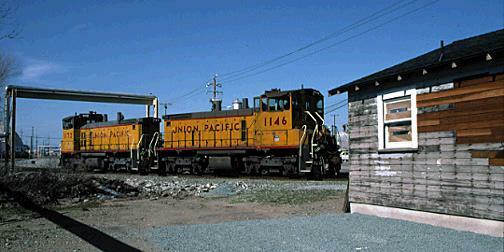 During a trip to California for Winterail in 1999 I visited many rail sites between Stockton and San Francisco. Here are some of the photographic results of that visit. There are two companion pieces in Trackside Travelogue for this trip. I hope you'll visit these also. They are Stockton Tower's Last (?) Winterail and A Day on BART. Altamont Commuter Express (ACE) 3102 approaches Stockton Tower on its way to the yard after completeing its run from San Jose (3/10/99). At the Port of Stockton we find Union Pacific SW1500s 1146 and 1172 waiting their next assignment. Power from BNSF and Port operator Central California Traction can also be found in the Port (3/11/99). 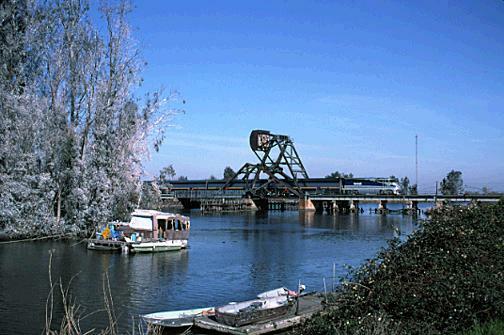 Also at the Port of Stockton is a large Alco C636 from the Port's former operator, Delta Bulk Terminal. The unit is numbered 1001 and its obvious Conrail heritage (No.6792) shows (3/11/99). Amtrak F59PHI 459 leads an eastbound San Joaquim train at Middle River on BNSF (ex-Santa Fe) about ten miles west of Stockton (3/12/99). 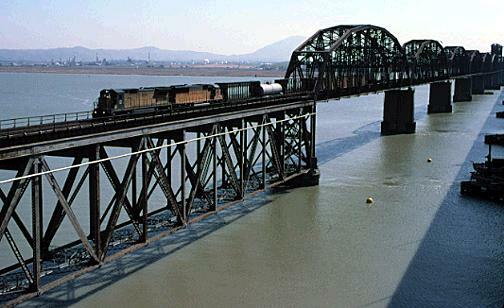 Chicago & North Western Dash 8-40C 8558 leads a train across the Strait of Carquinez at Benicia (3/12/99).